My first venture into upholstery and furniture refinishing continues! 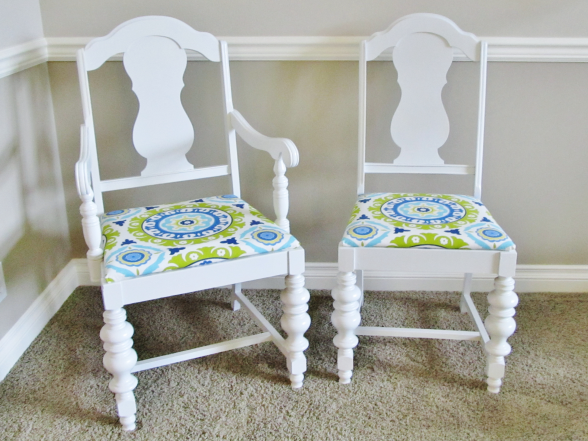 When I saw these two dining chairs I thought they were adorable and would be an excellent project. 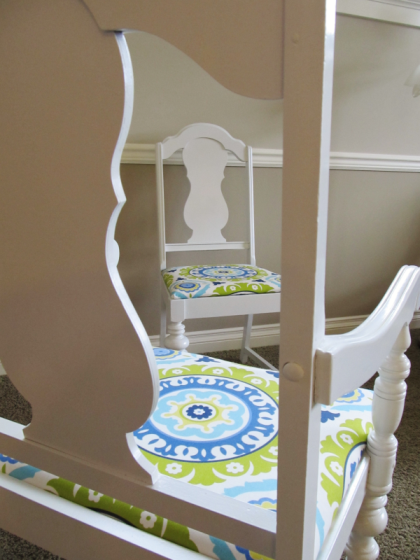 I love the "bones" of these chairs, the turned-wood legs and arms and the nice design on the back of the chair. 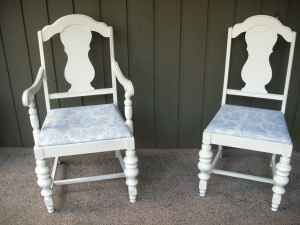 I wasn't sure if I wanted to keep these white or paint them a bold color so I decided to find a fabric I liked first, then let the fabric dictate the paint choice. 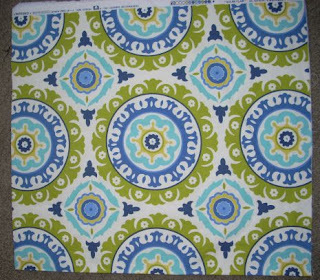 The fabric I found was Waverly Modern Essentials "Solar Flare". 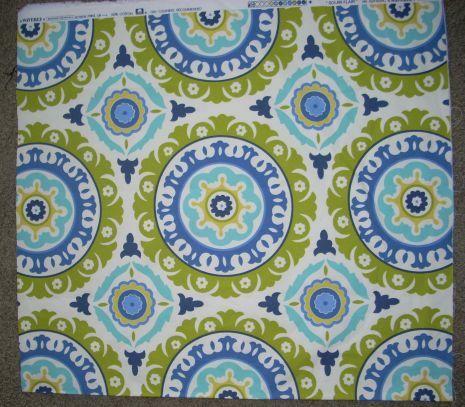 I purchased this fabric from JoAnn's Fabrics. One yard was enough to cover both seats, and of course I waited for the 50% sale! Waverly Modern Essentials "Solar Flare"
I found the chairs on Craigslist, $35 for the pair. They had a pale blue toile fabric that was stained and the paint job was a little sloppy and beat-up. 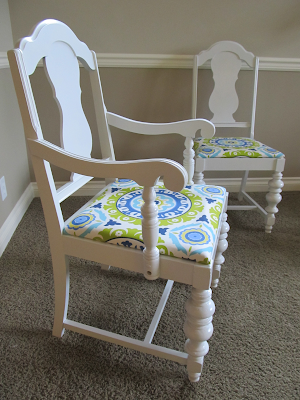 There were only the two chairs, not a full set of six, but the chairs are so interesting that I think they make cute accent chairs, even if they aren't used for dining chairs. 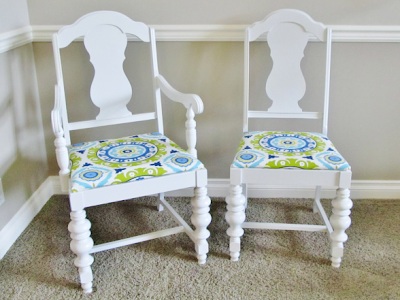 They could be an office chair or extra living room chair, or a new chair for my craft room. 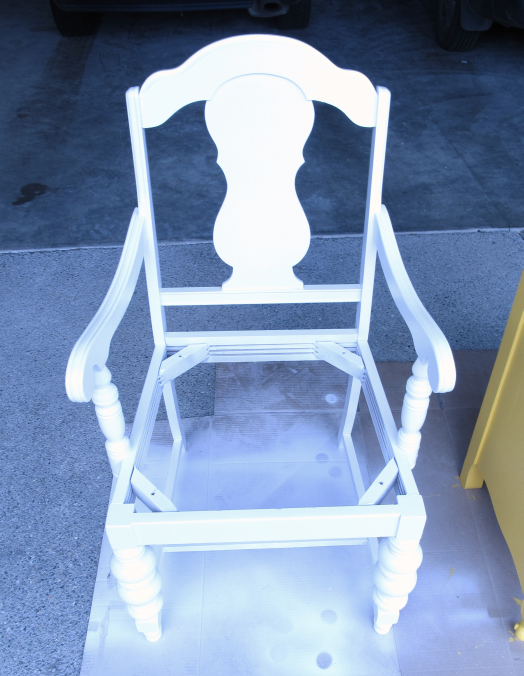 The first thing I did was unscrew the seat, sand down the frames, dab on primer and then add a few fresh coats of white satin spray paint. The previous painter had clearly only sprayed the chair from the top down and missed a lot of spots on the legs so the first couple of coats I sprayed on while the chairs were upside-down. When I removed the blue toile fabric I actually discovered the seats had been red velvet before that and even before the red velvet they had been this ugly brown cotton weave fabric. I left the first two layers of fabric on since they had been nailed on; the blue toile had been stapled on so it was easy to remove with a flat-head screwdriver and needle-nose pliers. I covered the red velvet with a layer of cotton quilting batting and then laid my fun fabric on top of the batting. 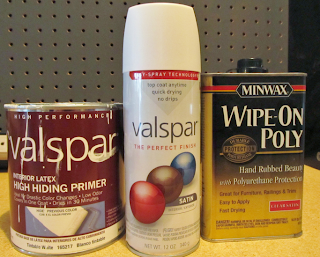 Lacking a staple gun, I used upholstery nails to take the fabric in place. The extra batting made the seat a little thicker so I ended up having to buy longer screws to attach the seats back in place. If you are looking for the best office chair under 200 that are not only fully adjustable but also are made from the strongest materials, these products above are a great choice.